MEMBERS: Father Son and Holy Spirit/I adore thee profoundly/i offer thee the most precious body/blood, soul and divinity of Jesus Christ/Present in all the terbanacles of the world/In reparation for the outrages/Sacrileges and indifferences by which he is offended/By the infinite merits of the sacred heart of Jesus/And the Immaculate heart of Mary/I beg the conversion of Poor sinners. 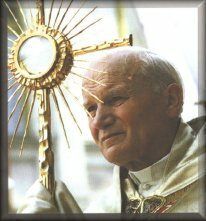 Members: Most holy trinity/I adore you/My God,My God.I love You /In the most Blessed Sacrament. MEMBERS: My God I believe and I hope/I adore you and love you/i beg pardon for those who do not believe/do not trust and love you/I love O Jesus /because you are Jesus .Your kingdom come. MEMBERS: O my Jesus It is For love of You/ in Reparation For the offenses/ committed against the Immaculate heart of Mary/and for the conversion of poor sinners. Rev. Fr lester(SJ) founded the knights of the blessed sacrament in 1915 to meet the world's spiritual crisic by trying to deepen man's union with God and pledging Love and loyality to our lord in the holy Eucharist. Moved by the ideals of this movement in Europe and motivated by a strong desire to help to correct the moral laxity in our Christain homes. Bro. Joseph Nkechukwu I tabor (who is now a Fransican Friar) started the movement of the Pages of the blessed Sacrament in lagos on August 20th 1960. The movement has spread throughout Nigeria since then.